Void war was my first real love in Warhammer 40K. It was Battlefleet Gothic that sold me on the grandeur of the setting and the scale of the battles that took place within it. The idea of fleet-based Space Marine Chapters hunting down elusive Dark Eldar pirates, or boarding space hulks filled with the damned, Genestealers or both had me hooked. So it should come as no surprise that I really like the idea of Zone Mortalis-type games, and battles taking place in the claustrophobic halls of 40K’s massive starships. Actually getting to play on a ZM board a couple years back at the LVO confirmed that fondness. The problem? Even by 40K standards, heck, even by “Regularly orders from Forge World” standards, the ZM board is expensive. Enter…the MDF alternatives. The desire to do Zone Mortalis with at least a modicum of acknowledgement that it’s wickedly expensive came primarily from what I referred to as “The Brexit Sale”, the day Britain lost its collective mind, and thanks to a suddenly very favorable exchange rate, the day everything Forge World made went on sale. A lot. Uncomfortably in the vicinity of things like “Mortgage Payment” scales. In today’s currency, a 6×4 table made up of the “Zone Mortalis Battlefield Network” (4×4) plus the “Realm of Battle Zone Mortalis Set” (2×2) comes to 550 GBP ($770). And that’s if you buy no additional doors, etc. Switching out the 2×2 ZM table for a Landing Pad, for narrative shenanigans in a slightly more open space, shaves about 20 pounds from that price. That is not to say it’s not a beautiful set – just that it’s a very expensive one. And one that’s by no means easy to assemble by the accounts of the people I’ve known with one, or easy to store. While I was actually shopping for some other terrain from Deathray Designs I saw one of their relatively new releases: Deadbolt’s Derelict. It’s a set of MDF corridors, junctions, etc. designed for use with Necromunda (the design inspiration is evident here), Warhammer 40K, etc. It looked perfect, so I ordered a set. But is it? The Deathray Design site is easy to order from, and at the moment Deadbolt’s Derelict (hereafter just called ‘the set’) only comes in one configuration, which makes things easy. 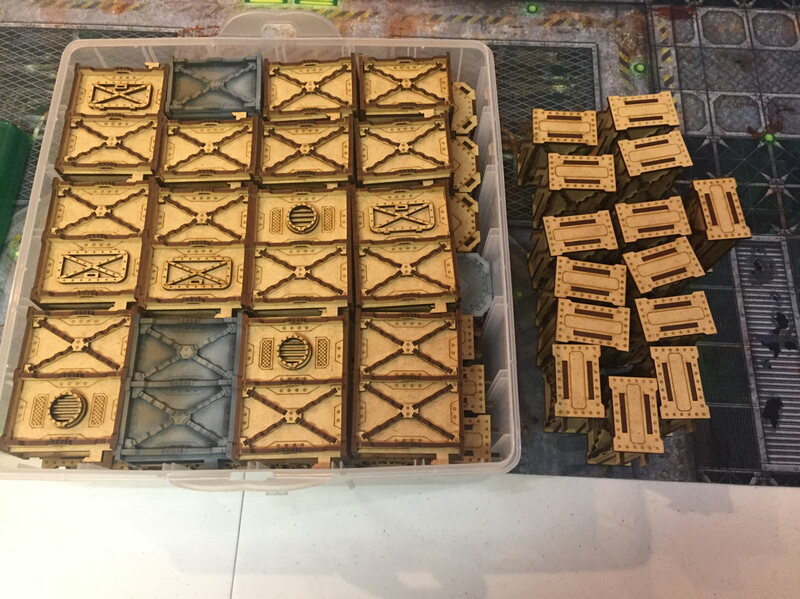 Made up of 18 double-spaced walls, 20 single-spaced walls and 24 junction columns, it’s enough to render your Necromunda boards in 3D. It also shipped fast – I noticed when I backed the Kickstarter that Deathray uses USPS Priority Mail, which can be a little expensive, but gets things there fast. As someone who is currently watching the glacial progression of an order from GW across the country, I appreciate that. Shipping for a single set from NC to WA costs a little over $40. This is less awesome for those abroad. Priority International is fairly expensive, with shipping to the UK at ~ $82, to Sweden at ~ $73, and to Japan at ~ $79. That’s a healthy percentage of the total cost of the product ($130) and it definitely eats at the affordability. There are other, especially UK based, manufacturers of similar products you may wish to consider if you’re on that side of the Atlantic, though for US customers their shipping is just as ruinous going across the pond. Shipping MDF is remarkably expensive, due to being heavy as hell. The product on arrival was in perfect form – a nice, secure, shrink-wrapped bundle that had fared the journey across the US without harm. There were a few loose bits, as there always are in MDF sheets, but I was thankful not to open up the box to be greeted with a shower of parts that had come loose. This would be, by far, my biggest mass-MDF assembly project to date, as mostly I had been working on one-off MDF pieces for various projects. While they weren’t included in the box (something most manufacturers don’t do, and which drives me a little crazy), the instructions on Deathway’s website were excellent, clear, and well illustrated. Invariably, when assembling terrain, you develop your own patterns that you end up thinking are clearly and obviously superior to the written instructions. For me, it was assembling the central support columns – I found it far easier to assemble those upside down. But generally, things went pretty well. There’s lot of little details in the kit – doors and support struts, lights and ventilation fan covers that add some complexity to things, but they went together without a hitch. At most, a few strokes of a file eased a part’s passage, but overall I found them quite secure. Just as importantly, the way the kits were designed meant there were lots of interior spaces to make strong glue joins between pieces without them ever showing. Given my approach to MDF is the liberal application of Elmer’s Glue-All, room to hide that where it won’t be seen was much appreciated. And the uniformity of the pieces here is an advantage – you can definitely get in a rhythm while you watch TV in the background, listen to a podcast, etc. The final product is pretty durable as well. I’ve shown no particular care to it, transported the set for a bit just tossed in a plastic bag to move it downstairs, dumped it out haphazardly, etc. without incident. 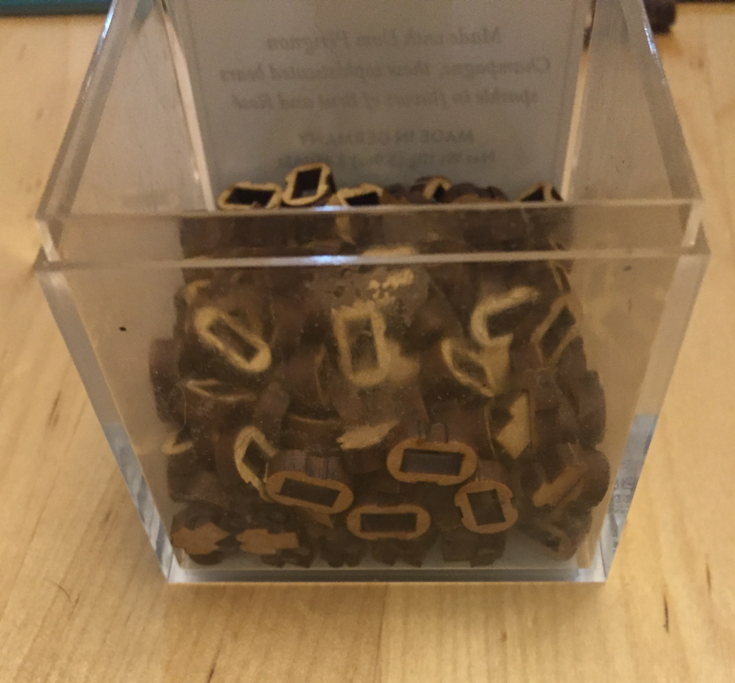 One nice thing was that there were a fair number of spare parts – if something snapped, just didn’t fit, or fell onto my variegated carpet never to be seen again, it wasn’t the end of the world. What was a little alarming was the amount of spare “light fixtures” for the central columns that you get. It’s a huge pile. I emailed Deathray, a little alarmed – one should not end up with that many spare parts, which made me worried I had done something badly wrong. Instead, I have been assured that there was an error in laying out the sheets that means that yes, you do get a small avalanche of spare light fixtures. Painting MDF always makes me nervous, for two reasons: MDF is porous, and MDF is a fairly broad class of material. What that means it will definitely soak up water-based paint, and how much it does so and what that ends up looking like may vary pretty wildly. Which means the priming stage is essential. Deathray Designs recommends Rustoleum Flat Black Professional Enamel, which makes sense. Enamel paints bind well to surfaces and are generally pretty durable, flat black will give a good painting surface to work from, etc. The issue? This stuff is hard as hell to find in my experience. I struck out at three stores, though of course it can be ordered from online. All of them worked…fine. The Stynlrez (note MDF is nowhere in the Styrene-Vinyl-Resin based name) covered well over a shellac layer, while the Krylon paint had a somewhat disappointing tepid black tone to it. It works fine as a primer, and I wouldn’t be disappointed if I painted with it, but this is the first time I’ve had a strongly “meh” feeling about it. A layer of shellac (which I suspect was essential for the airbrushed primer) did little to help things. The Rustoleum primer was by far the most aggressive of them in terms of a spray, which was a little intimidating, but I could see being really nice if you wanted to tackle a whole terrain set all at once. My intention with the primer was to go with the Rustoleum – when in doubt, follow the manufacturer’s directions. Then the world remembered it was winter, and the temperature plummeted. With daytime temperatures often below freezing, an industrial spray primer was out of the question, so I went with the considerably-less-toxic spray shellac and an airbrushed primer. I chose a pretty simple “Battleship Grey” theme for the set – doing some pre-shading with white, before giving the whole piece several thin coats of Minitaire’s Concrete Slab, a nice mid-tone grey. I followed that up with a quick spray of Daler-Rowney Payne’s Grey ink to put some more emphasis in the shadows, and a gingerly light spray of Daler-Rowney Burnt Umber to suggest some weathering and that patina that everything in 40K seems to have. This was followed up with Minitaire’s Nebula Red around the light fixtures to suggest some emergency lighting. That was finished by a round of Krylon Gloss Sealant for durability, and two layers of Krylon Matte Sealant for more durability and to knock down the shine. There’s other weathering you could do – chipping, which I may do around doors, grime, etc. But for a pretty quick and easy recipe that could be hammered out in pretty short order, I think things ended up looking pretty good when set up on a Frontline Gaming “Starship Interior” mat. I intentionally didn’t order enough sets to cover a full board – I wanted to try out the product before going all in, for what should be obvious reasons. But how much does a set actually cover? Deathray suggests two sets for a full board, and so out of curiosity, I laid out my set roughly following the mat below it. There are a few things I’d add to the set to fully flesh it out as a ZM board. The first is doors. There are no doors, and this is…something of a problem. While there are some sections with doors build into them, I think they’d be a pain to attach and detach, and I’d much prefer free-standing, removable doors. Fortunately, the Necromunda range from Games Workshop has an ample supply of suitable doors for $35 (or you could get the genuine ZM doors for a less reasonable price. Picking up a set of the Barricades and Objectives probably isn’t a bad idea either to add some depth to the set. The other thing I would pick up would be some objectives and other bits to add “flavor”. Here Deathray has some good designs of their own in other ranges, with specimen tanks and consoles, but there are lots of options here from GW and other sources. So what would it cost to make a 6×4 board? Lets say two sets – $130 each. With shipping, that puts us at ~ $340. 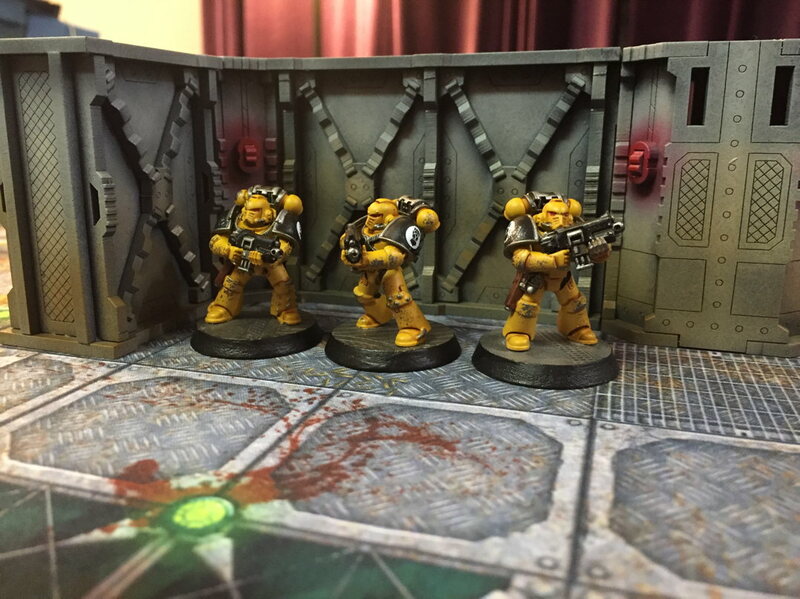 Add in a set of Necromunda doors for each set for $70 and we come to $410. I’m not going to include the cost of some objectives in the “additional gubbins” budget because frankly, I think you should be buying those with a genuine ZM board as well, and there’s probably more than enough bits in the average collectors collection to cobble something together. So $410 for a 6×4 table. That’s still expensive, but we’re talking about a full table of extremely dense terrain. It’s also effectively half-price, even when you add in a ton of doors and the cost of shipping, for a highly configurable terrain set that packs down really small. If you were willing to treat the “walls with doors in them” as the doors, you could probably stretch your budget even further. Is it a full-on, drop-in substitute for a ZM table? No. MDF can’t capture some of the richness of detail of resin. The light fixtures require some abstraction. The vent covers don’t have vents behind them. You could put some of those in using aftermarket resin pieces, but that starts to raise the price. But that’s not really the point of MDF terrain. What it’s meant to do is give you a good, workable table in a short amount of time at a (relatively) affordable cost. And do I think a table worth of this terrain, with some fun objectives, two painted armies, and perhaps the occasional little detail (a propaganda poster pasted on a column, etc.) will look amazing? Absolutely. But probably the firmest recommendation I can give? I’m going to order another set to finish the table out. Overall Grade: 8.5/10. A solid, evocative and functional offering, but one that needs a little supplementation. Shipping may be prohibitive for non-US destinations. Deadbolt’s Derelict is available here from Deathray Designs. And they have been kind enough to offer readers of Variance Hammer a special deal. Use the code vhderelict10 for 10% off your order! When I set up my Necromunda set I found the tiles are not quite 12″ square as I had thought they would be. They’re something like 11 1/2″. 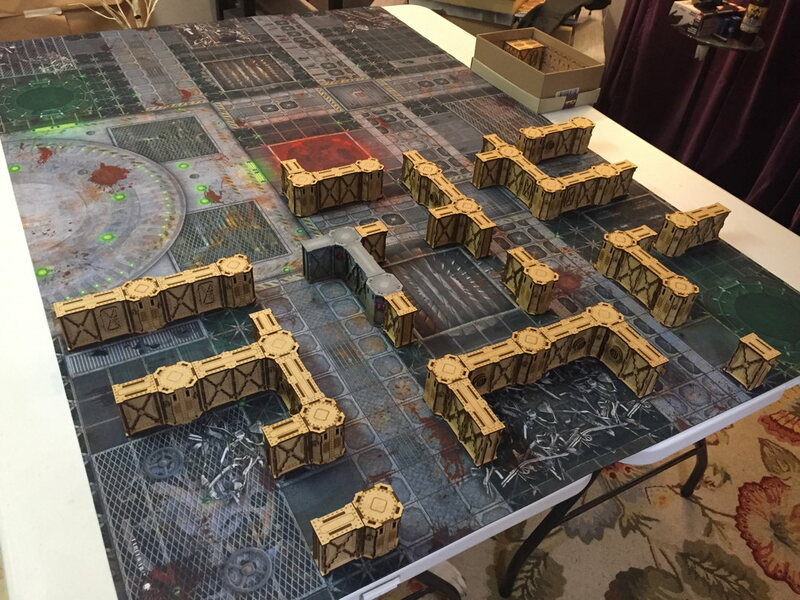 Have you tried setting up these walls on the Necromunda tiles? How well do they fit? Honestly, I didn’t bother picking up Necromunda, as no one in my area plays it. But there’s some video online that seems to suggest they fit pretty well. I would also note that a lot of ZM/Necromunda-type games don’t need a full 4×6. Add in some scatter terrain, and one set might well do for a 4×4 table. Also, if you haven’t seen them in person, the Necromunda doors and barricades really are pretty nice. I’m thinking of picking up a couple more sets at some point. Yeah – it doesn’t really need the 4×6, I just decided to go big or go home. I think a single set would work great for a 4×4 with some scatter terrain in some larger “rooms”. I do like the doors and barricades. I’ve got the barricade set, and the doors are on order – FedEx Smart Post is sending them on an epic saga through the U.S., but they should get here today. FedEx SmartPost really does like the epic journeys. I had one shipment go up to the twin cities, then back down to within a hundred miles of GW’s facility, and then head up here. No idea why my stuff was on that truck for those three days. I’ve actually just started working in logistics and I can pretty much confirm this. I’ve processed shipments coming in on an ocean longer to a port in California, brought by rail and truck to our partner warehouse here in Chicago, then sent back to a final destination in California. It sounds mental, but it all comes in one big 40′ shipping container that has a dozen or so different customer’s shipments inside, all going different places, and our warehouse just happens to be where that container is slated to be separated out into multiple orders. Obviously this is mostly industrial freight, but I imagine similar principles likely apply in shipping consumer goods. I’m never going to have the space or time to do this. But it’s amazing to see that this type of stuff is available “on a budget” and it looks absolutely fantastic! Another option for zone mortalis on a budget is [Hirst Molds](http://www.hirstarts.com/). 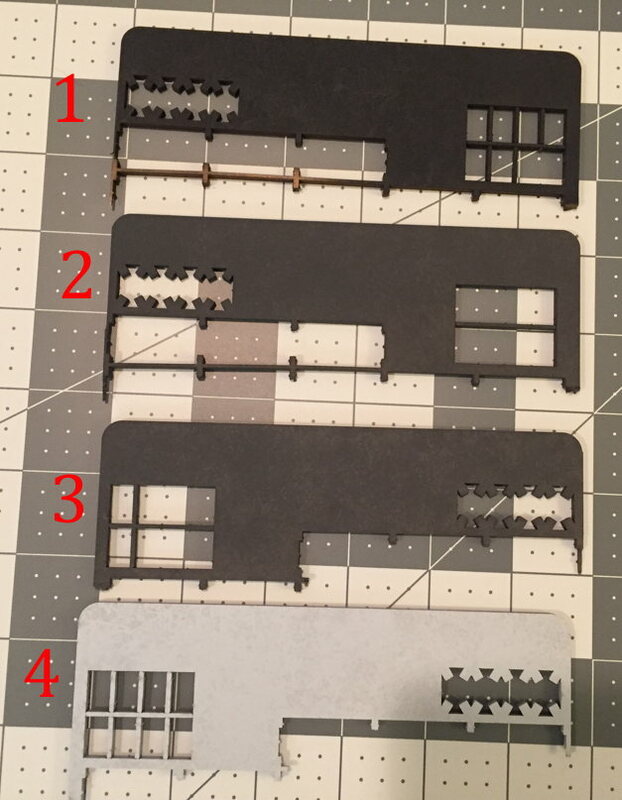 Get 3-4 molds, maybe more depending on your budget and plans for other projects (I’m currently working on 3, Roborally, Imperial Assault and Space Hulk, with ZM as a future project) … Get your diestone off of ebay (if you dig around on the hirst site you can find a good suggestion). It’ll be more work, but you can make your ZM look just how you like. They are excellent! They”d also look good in Necromunda as Delaques, or Cawdor gangers. I really like these.